Since it is not possible to travel to North Korea from Seoul, the first ever brewery tour of North Korea technically begins in Beijing. Of course, this first leg of the journey into Pyongyang is far from simple, which is why only around 5,000 westerners visit each year. Facilitating our trip is Koryo Tours, a Beijing-based company that has been taking groups to the Democratic People’s Republic of Korea (DPRK) since 1993. Founded by Nicholas Bonner, an energetic Brit with an encyclopaedic knowledge of the country, the company has become a preeminent force in cross-cultural activities such as Pyongyang’s marathon and film festival. The night before the trip, we meet up for beers at Great Leap Brewing in Beijing and Nick regales us with stories from his many years of dealing with the intricacies of North Korea. “It’s going to blow your minds”, he assures us. Though given the sensitivities around journalism and the whole topic of South Korea, he also warns us to tread carefully. Although the other breweries participating in the project aren’t able to join the trip, on account of being South Korean nationals, Erik Moynihan from Magpie brewing could. 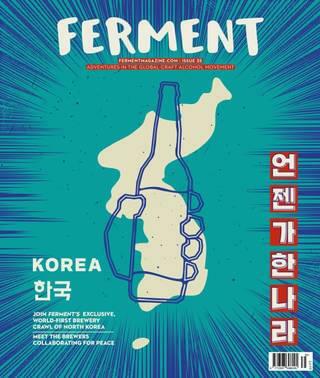 As a Canadian, he is free to come along as a representative of the South Korean brewing scene. Not quite sure what we were getting ourselves into, we retire to bed and awake the next morning for our flight with Air Koryo, the national airline of the DPRK. Consistently ranked as the worst airline in the world, owing to international sanctions, Koryo’s ageing Soviet aircraft judders uncertainly into the air. On board are several other western tourists and some Chinese, but mostly there are North Koreans; you can tell, because they wear a pin badge at all times, featuring images of Kim Il-Sung, Kim Jong-Il or both. In-flight entertainment consists of propaganda films, accompanied by the airline’s infamous ‘mystery meat’ burger served by immaculately groomed cabin crew. We have been forewarned that accepting a copy of the in-flight newspaper carried certain risks. Failure to fold the paper in such a way as to avoid creasing any images of the leader would potentially be an ‘issue’. Unsure at this point as to whether ‘issue’ was a polite euphemism, our group nervously declined to get our fix of that day’s news. Despite its reputation, Air Koryo delivers us in one piece to Pyongyang Sunan International Airport. With only four aircraft allowed to fly internationally and limited routes to Shenyang, Vladivostok, Shanghai and Beijing, there isn’t much of a queue at customs, which is just as well because this is a moment we’ve been quietly dreading. How would the border guards of this notoriously secretive regime react to our suitcases filled with camera equipment and recording devices? As it turns out, the only item in our possession that attracts even the slightest attention was a humble book, though I’ll admit my heart does skip a beat at being led aside so its cover can be more closely inspected. With a shrug, the Scandinavian crime novel is returned and we wander into arrivals. We meet the three guides, cameraman and driver who have been tasked with taking care of us for the coming week, along with Marcus McFarland from Koryo tours. As it turns out, entering North Korea isn’t the terrifying ordeal we had built ourselves up for and our hosts welcome us with bright smiles. Despite their cheery demeanour though, the lingering fear that our new friends might yet seize on some obscure infraction weighs heavily on our minds for now. Driving into Pyongyang, we stop at the immense Arch of Triumph and, on its apex, get our first view over the pastel-coloured skyline of Pyongyang. With barely any traffic on the roads and none of the hustle and bustle usually associated with a city of its size, the atmosphere is very peaceful, albeit eerily so. Desperate to taste North Korean beer, we are taken to the ‘Moran Beer Bar’. As the bar staff pour our pints, we don’t really know what to expect. Served alongside some typical North Korean bar snacks of dried fish, heads intact, our first taste of the local beer comes from the Ryongsong brewery. At 4.5%, it’s a slightly hazy pale lager, pleasant enough for us to soon find ourselves enjoying a second round. Getting to know our guides a little better and sharing some laughs, we started to feel a lot more comfortable with our surroundings. We check into the Yanggakdo Hotel and enjoy our first proper taste of North Korean cuisine, before a few more beers at one of the hotel’s five bars. Since petrol is hard to come by and distribution is challenging, many businesses such as hotels, restaurants, the local bowling alley and even a train station have taken to brewing their own beer. We meet the hotel’s head brewer and, as well as showing us his brew house, he shares with us a little about the history of brewing in the DPRK. As we talk, we pour him a few beers we’ve brought from home. He enjoys Moose Moose from Fierce and also his first taste of a Double IPA from Verdant. Surprised by the strength of hop flavour, he politely explains that North Koreans prefer more subtle styles, in particular lager. There is also North Korean steam beer, originally an American style which has become popular among the country’s brewers. Effectively a lager, since it is brewed with bottom-fermenting yeast, it is fermented at ale temperatures due to the challenge of maintaining a vessel at the 3°C that would be customary for lager. This results in a distinctive profile that includes both ale and lager characteristics. Brewing began in Korea under Japanese rule in the 1930s and, although not anywhere near as popular as soju, it is the second most commonly drunk alcohol. ‘Standing bars’ are a popular spot for North Koreans to unwind after a day’s work, where they can enjoy part of their monthly ration of five litres from the government, or buy more for around 30p a pint. We try in vain to ration our own intake of beers as we explore the facilities of the hotel, staying up into the small hours, playing pool and generally goofing around with North Korean guests and bar staff. Of course, they like to have a laugh just like anyone else and are curious to flick through the photos on our phones to understand the strange place we have come from. In some ways, we’re surprised by how much they know of the outside world, claiming to have read Harry Potter, for instance. Curiously though, the mention of ‘Halloween’ prompts a search via smartphone on the country’s ‘intranet’. The lack of results reminds us of our vast cultural differences. Despite this, it’s clear that unless we do something reckless we’re going to get along just fine. The next morning, however, is not an occasion to fool around. In fact, we’ve got to put on a shirt and tie for a visit to the ‘Kumsusan Palace of the Sun’, where the country’s ‘eternal leaders’ bodies lie in state. It’s the most sacred location in the country, and we’re requested not to take anything inside. Nothing. Standing two-by-two, as instructed, we travel at a snail’s pace along what feels like miles of airport-style travellators. Reminded to stand up straight, not to put our hands in our pockets or to lean on the handrails, we pass by photographs from throughout the leaders’ lives. We arrive in a hall with two uncanny waxworks of the leaders standing in front of an image of Mount Paekdu, considered the spiritual home of the Korean people. This place is enormous. In one room is a train. An actual train carriage, used by Kim Il Sung to travel the country. In the next room is his yacht, then in another are the three cars he used throughout his life. Finally, we arrive in a room filled to the rafters with awards, medals and honorary doctorates from Yugoslavia, Cuba, Hungary, the Soviet Union and the like. We pass through a machine which blows dust off our clothes, as we enter the chamber in which Kim Il Sung’s remains lay in a glass cabinet. We approach in rows of four and follow the rules we had been given earlier: to bow three times, once at the feet, again at the left of the body and once more at the right. With an armed soldier in each corner of the room watching our every move, it is a surreal scene to say the least. Next up, we tour the artefacts of the next generation of the Kim dynasty. Kim Jong Il’s train carriage, where it is claimed he died, has apparently been preserved exactly as he left it, complete with his MacBook on the desk. We view all of his awards and medals and then we repeat the bowing procedure in his chamber. Our day of respect-paying is not yet over though, as we are taken to the Mansudae Grand Monuments. These twenty-two-metre-high bronze statues of the leaders are also of grave significance and it is customary that, as a foreign delegation, our guides lay flowers as a mark of respect. Later that night, we get the chance to witness easily the largest and most extravagant display of human performance on Earth, the ‘Glorious Country’ Mass Games. Over the course of the evening some 100,000 gymnasts, dancers and acrobats perform a reliably propagandistic 90-minute routine. In the sky, hundreds of synchronised drones spell out “Glorious Country” in lights, while a thousand schoolgirls juggled balls, sitting atop the shoulders of a thousand uni-cycling schoolboys. On the far seating area of the stadium, the largest in the world with 114,000 seats, some 17,000 schoolchildren hold sets of coloured cards. How they do it is hard to fathom, but they somehow know which card to show at which moment and the result is a constantly moving animation of text, characters and communist iconography. With sightseeing out of the way, we get back to our beer-tasting itinerary. Over the coming days, we visit a number of different breweries and bars in and around Pyongyang, including the ‘Paradise Beer Bar’. We also visit the city of Kaesong, close to the border with South Korea. The ancient capital of the Koryo Dynasty, it is said to be where the best ginseng in the world is grown. At the Kwangbok supermarket in Pyongyang, we get our only chance to spend local currency. Elsewhere, we’ve paid with euros, Chinese renminbi and US dollars, receiving change in baffling combinations of all three. 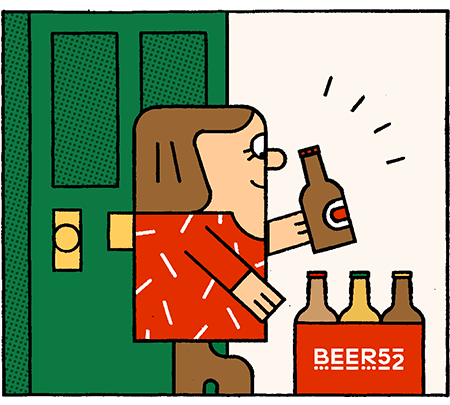 We stock up on one of every brand of beer on sale, from the ten commercial breweries in North Korea. We also buy soju, makgeolli and interesting local liqueurs, flavoured with mushrooms, pine needles and ginseng. We enjoy a post-shopping pint in the store’s food court, with locals eating their lunches around us. To much amusement, our group exchanges the few words we’ve picked up in Korean – “Cheers! Beer! Comrade!” – before heading on to our next stop, the Chukjon Kyunghyung Brewery. Like everything we’ve been shown, the brewery is spotlessly clean and the director is proud to show us the gleaming control panel of his brew house. Staffed by employees wearing uniforms more suited to astronauts than brewers, we know this is a serious operation. He explains the popularity of beer is growing but that competition between the breweries, although all state-owned, is fierce. When we reveal that the double dry-hopped Milkshake IPA we’ve brought for him to taste contains lactose and 24g of hops per litre, he shakes his head in dismay, “that’s not how you make beer”. We enjoy a fresh glass of his own creation, a characteristically North Korean light lager. As with all the beers we’ve tasted so far on the trip, it ranks fairly highly as far as macro lagers go, certainly better than the likes of Hite from south of the border. We bump along sparsely trafficked rural roads, painstakingly lined on both sides for hundreds upon hundreds of miles with blooming pink azaleas. In the city of Pyongsong to the north of Pyongyang, we check into the Jangsusan Hotel during a power cut and settle in for a marathon tasting session of all the drinks we’ve collected throughout the trip. From perfectly drinkable to a case study in off flavours, the quality is variable to say the least. Beers from the same brewery but from different months even taste markedly different, likely due to seasonal changes in fermentation temperatures. If you think you’ve had a hangover, I can assure you that you haven’t really until you spend an evening putting away North Korean distillates. The next day, we valiantly continue our adventures at the jewel of the North Korean brewing industry, and favourite of the night before, the Taedonggang Brewery. “Don’t take any photographs of the armed guards”, we’re warned, as we drive past two teenage-looking girls holding semi-automatics at the brewery gate. With a pristine 20-foot high mosaic mural of comrade Kim Jong Il inspecting the brewery’s bottling line in front of the building, we realise that this is unlike any brewery we’ll ever visit in our lives. Although we’re its first international tour group, it’s not Taedonggang’s first tour, as evidenced by the ornately framed photographs of the leader at the brewery’s founding ceremony. Of huge personal and state importance to the leader, the brewery was one of the first companies in this communist country to produce a TV advert. Broadcast alongside an ad for hairpins and another for ginseng, the gaudy two-minute 34-second spot features technicians testing the beer and bottles flying through space. The company also hosted the country’s first beer festival in 2016, with locals and visitors alike enjoying beers beside the illuminated floating restaurant in central Pyongyang. Named after the Taedong river, which runs through Pyongyang, its seven beers (imaginatively named Beer Number 1, Beer Number 2 and so on) are distributed nationally and even exported to China. We present several beers, including a New England IPA from Northern Monk’s Patrons Project, to the brewers. Discussing plans for the future, the head brewer explains that consumers’ tastes are becoming more demanding and that they’ve even been experimenting with ginseng and other typically North Korean flavours. The history of the brewery itself is fascinating. Back in 2000, Ushers of Trowbridge, famous for its Best Bitter and Founders Ale, was put up for sale. It was ultimately bought by the North Korean state via a German broker, Uwe Oehms, who specialises in shipping second-hand breweries to unusual places. A team of North Korean technicians was sent to Wiltshire to dismantle it piece by piece and pack it into 30 shipping containers for the voyage from Bristol to Wonsan, two hours east of Pyongyang. Nick Crewe, an English engineer, spent nine months working with a team of North Koreans to re-construct the brewery on a field outside Pyongyang. He explained in an interview with the Independent at the time that the workers were kept motivated with propaganda from loudspeakers and free cigarettes. Since then, the brewery has added a taproom in what appears to be preparation for more visitors like us. But, as we prepare to work our way through its seven famous beers, we’re informed that only Number 2 is pouring today. Welcome to the planned economy, folks. Eager to get a taste of the other varieties, we head back downtown to ‘Taedonggang Beer Bar Number 3’. The beers are described based on their varying percentages of barley malt, wheat and rice. Ranging from a tasty all-barley to a paltry all-rice, we conclude our favourite is No. 2 after all, the version with a gold circle around the 2. Compared to the label with a black circle, we establish that this is the ‘export’ version and is marginally higher in ABV and, according to the brewers, uses “more technology”. The most famous restaurant in the country, Okryugwan, is our stop for lunch and the best place to sample the national dish of ‘Naengmyeon’: spicy buckwheat noodles served ice cold, or sometimes with ice. It’s so delicious that the South Korean president and Kim Jong Un had eaten the same lunch as us, in the same place, just days before. If you spot it on a menu in a Korean restaurant in the future, as strange as it might sound, be sure to put in an order, even if they won’t taste quite the same as they do in Pyongyang. Farewell drinks take place in the revolving restaurant at the top of the Yanggakdo hotel, followed by karaoke with our guides. We feel quite tearful knowing we may never be able to communicate with our new found North Korean friends again. Officially, it was their job to show us the side of their country that their state wanted us to see; that goes without saying. But, by getting to know each other, we’ve learned something about their lives, as they have about ours. We’ve connected with each other on a human level over a few beers and, for what it’s worth, North Koreans tell jokes just like we do, have dreams for their lives just like we do and, just as we do, hope that things will get better. Before leaving, I let them know that if they ever get the chance to travel, they always have a home in Scotland. We joke that the first month will be free but they need to pay rent after that. How alien our world will seem to them we can only begin to imagine. The next morning, our guides wave goodbye to our train as we begin the 23-hour ride back to Beijing. As we roll through the countryside, watching rural scenes that could be from a hundred years ago, we feel all kinds of mixed emotions. A fondness for the people who have shared with us things no other tourists have seen before and a curiosity about what will happen next in this complicated country of 25 million souls. Note from the editor: Could we print the most interesting photos our team took on this trip? No, that would be reckless and could put our guides’ careers at risk. Similarly, we’ve respected the wishes of our various interviewees not to be named in this feature. While we saw more of this mysterious nation than we expected to, there is no doubt we were given a sanitised, press-friendly version of life here, and came away with many questions. It is this personal experience, rather than an authoritative picture of the ‘real’ North Korea, that is presented here.